Bekah Chapman practices at the Spine Physical Therapy clinic at the UW Health Research Park Clinic. 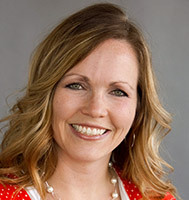 She attended Northwest Nazarene University in Nampa, ID, for her undergraduate degree and then went on to get her Doctorate of Physical Therapy from Idaho State University in Pocatello, ID, in 2005. Since 2010, she has specialized in treatment of the spine with a Certification in Mechanical Diagnosis and Therapy (Cert. MDT); and is currently working on a certification as a Manual Spine Therapist (CSMT) with the International Spine and Pain Institute. Bekah is a member of the American Physical Therapy Association and the Wisconsin Physical Therapy Association.